What is it with weebs and this name? Straight from the Rift and ready for anything, Drift enters the mix in pursuit of a Victory Royale! Unlike most multiplayer shooters, Fortnite only has one map: it's an unnamed island with many different zones, all accessible at once (at least until the game herds everybody together). And though there's no official, documented story, the map undergoes periodic changes that create an ongoing background narrative, kind of like an MMO. For instance, the "Season 3" patch introduced a small speck in the sky, which grew larger and larger over the following weeks, until Season 4 began with a giant meteor hitting the island, destroying some of the existing areas and literally changing the landscape. Eventually, a villain's mountain compound was discovered on the west side of the map, with a launch pad inside; Season 5 began with the rocket launching, and tearing an interdimensional rift in the sky - which is what this figure's bio is referencing. Another feature added at 50,000 xp? A stylish kitsune mask. The mask is white with pink detailing inside the ears, around the eyes, on the eyebrows and cheeks, and striped on the chin. There's black paint to outline the mouth and underline the nose, and to draw attention to the eyes. A pattern of crossing lines sculpted on the forehead is painted gold. 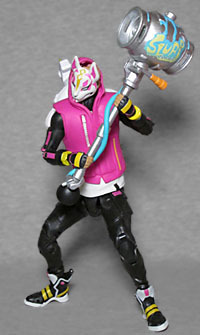 The mask really does look very nice, especially surrounded by the pink hood. 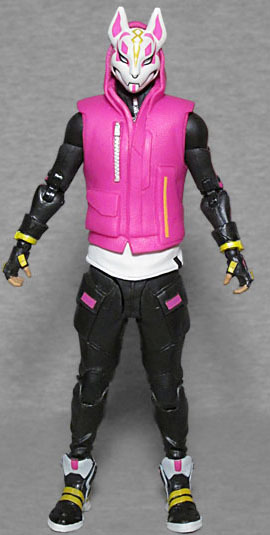 It does look a little feminine, which only makes us sad that Drift is a dude. This whole outfit would look great on a woman. The Fortnite figures all come with a backpack, a melee weapon ("harvesting tool"), and a ranged weapon. Since the Battle Pass introduced a new harvesting tool that was awarded specifically for progressing through Drift's challenges, you might expect he'd come with that, right? Well, the Rift Edge wasn't unlocked until one stage higher than this outfit, so it wouldn't make sense. 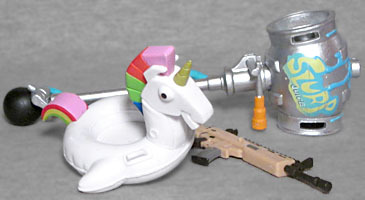 Instead, he gets the Party Animal, a gigantic mallet that seems to be built from a keg. A keg of "Slurp Juice." His gun is the same one Cuddle Team Leader came with, but the Back Bling is an inflatable "Pool Party" unicorn. Drift continues the trend of these Fortnite figures having shockingly good articulation, with a slight exception. He's got a balljointed head and neck, balljointed and swivel/hinge shoulders, swivel biceps, double-hinged elbows, Revoltech-style swivel/hinge/swivel wrists, a balljointed chest, a balljointed waist, swivel/hinge hips, swivel thighs, double-hinged knees, Revoltech ankles, and hinged toes. Again, the shape of the legs keeps the thighs from swivelling much at all, but that's not the problem we're talking about. The vest and hood are molded as a single piece, and it's glued into a notch in the head; the idea being that you can turn the head and have the hood go with it, but the rubber used is too thick for that to happen; so basically, there are head and neck joints, but they really don't do anything unless you pry the hood and the head apart. McFarlane Toys' weird release schedule for these figures continues unabated. Sold in a bright orange box, Drift is part of Series 2, but so far it seems to just be him and one other figure, and only at one place - he was first available on February 23, during GameStop's "Pro Day" sale, and hasn't dropped anywhere else. 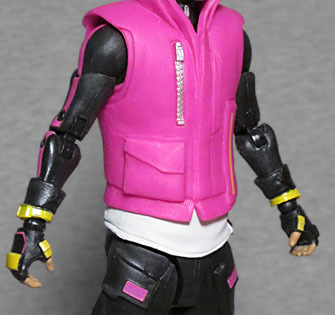 McToys picked the best version of the costume for its toy, but the stiff hood does bring him down just a little.